Behold, a summary of the long Goods Steps series! The series is not complete yet but I realized today that the series is getting cumbersome. I will update the summary when the remainder of the posts have been posted (which will, hopefully, be sometime within the next couple of years. Ahem.). For those of you who don't know, The Goods Steps pertain to the Household Goods category of Setting Up Housekeeping. Goods Step 1: Make a list of everything you will need. Goods Step 2: Make a list of what each of you already have. Goods Step 3: Consolidate your goods (on paper at first). Goods Step 4: Make a list of what you need to acquire. Goods Step 5: Divide your list in terms of how you plan to acquire the goods. Goods Step 6: Register for gifts. Registry is useful but not required. Goods Step 7: Acquire the things you don't expect to receive as gifts. Goods Step 7: If It Is to Be Purchased . . .
Goods Step 7: If It Is to Be Made . 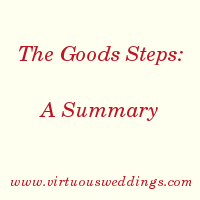 . .
Goods Step 8: After the wedding, reevaluate and acquire still needed goods.